Schama (History/Harvard), author of Patriots and Liberators: Revolution in the Netherlands 1780-1813 and The Embarrassment of Riches: An Interpretation of Dutch Culture in the Golden Age, offers an epic new history of the French Revolution in honor of this year's bicentenary. Utilizing day-to-day accounts of people ordinary and not so ordinary, presenting them in the highly accessible manner of traditional narrative, Schama synthesizes many theories that have populated the historical writings about this era. Thematically, his most important contribution is in revealing French culture and society in the reign of Louis XVI to have been "troubled more by its addiction to change than resistance to it." Similarly, he contends that "much of the anger that fired revolutionary violence arose from the hostility towards modernization, rather than impatience with the speed of its progress." Thus, the "new class" that arose against the monarchy turns out to have been not new at all--but rather doctors, lawyers, noblemen, priests, and other professionals. 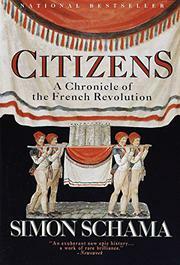 In the end, Schama appears to have a closer affinity with Tocqueville than has been seen in a century. He chastises the Revolution as having actually been destructive of all the little triumphs of modernization that had been accumulating under the old regime ("Marseille and Lyon only recovered as the Revolution receded. . ."), and all for a cause that produced no great social transformations and which only relieved Frenchmen's extraordinary taxes as their military frontier expanded: "When that frontier suddenly retreated in 1814. . .they were stuck with the bill which, just as in 1789, they refused to pay, sealing the Empire's fate." As for advances of the rural poor, Schama argues that "the Revolution was just an interlude in the inexorable modernisation of property rights that had been well under way before 1789." Indeed, the major legacy of the Revolution, as he sees it, is a negative one: "the invention of a prodigious new kind of warrior state," as well as a ubiquitous violence that forever marked it in blood. In all, a refreshing vision narrated in a passionate style, without sacrifice of detail.